I’m becoming quite the fan of M.J. O’Shea because of Dreamspinner’s Dreamspun Desires series. I loved Millionaire Upstairs and I was head-over-heels for Duke in Hiding. Small town New Hampshire native Theo is a landscaper who earns extra cash during the winter tending bar. When Heath Blackwood arrives in the bar, the two spar. Heath doesn’t want to be there and Theo is no mood for an uppity Brit no mater how cute he is. What Theo doesn’t know is that Heath has been forced to hide in the States because of death threats. Slowly but surely the two men soften towards each other and there’s less sarcasm so a friendship can grow followed by an attraction. O’Shea builds all of this perfectly as no part of the relationship builds too fast. 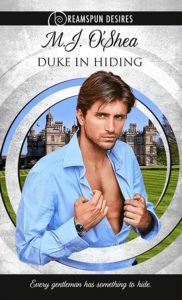 Of course, things take a turn when Theo find out Heath is a duke and he gets pulled into the world Heath deals with. It’s more than small town Theo can deal with, even though he loves the man who is the duke. What makes O’Shea books so great as she takes such care in growing the relationship so it doesn’t feel fake in any way. I loved how Theo battled with himself over falling for someone who he knew was leaving (and that’s before Heath was revealed as a duke). Heath felt the same way–the risk of finding that perfect someone in the place he didn’t live. Their careful steps towards each other were delightful. O’Shea just released a new novel, and has another Dreamspun Desire coming in August. I’m looking forward to seeing who she’s setting up this time.